It has been a while since the last release of a game of the Japanese manga and anime series, One Piece. With the last being the successful One Piece Pirate Warriors 3, they needed to come up with something even better. This last game’s story featured a journey through the original story of One Piece up until the Dressrosa Arc. 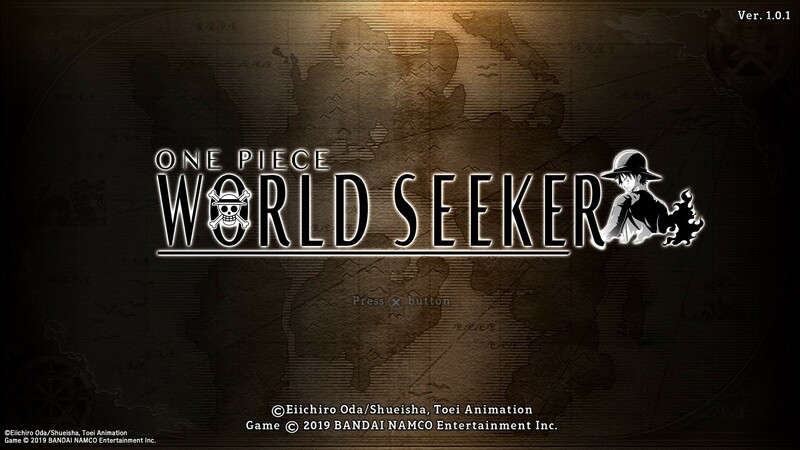 Now with One Piece: World Seeker, they’ve created an original new story outside of the story of the original manga and series. With it being an RPG game, fans were really excited for this new release, although it’s not exactly what they’ve hoped for. In this new adventure in the One Piece universe, you’ll play as Monkey D. Luffy, the captain of the Straw Hat Pirates. Luffy and his crew, in their ongoing mission to acquire treasure, end up on an island that is home to multiple large pirate prisons. The rumored treasure turns out to be just a ploy to capture the Straw Hat Pirates. Luffy escapes captivity and decides to help the citizens get their homes back. This leads to him and his crew getting entangled in a decade-long conflict between those who admire the Marines and those who detest them. The game starts with a nice cutscene of what happens before you begin on the new island. This cutscene is worked out perfectly and really hypes the fans for what will be coming next because they used most of it in the trailers. Unfortunately, this will be one of the only moments the story is worked out so well. After this cutscene you’ll immediately notice that voice acting won’t be used that much anymore. All the conversations will be read in subtitles and all the characters will only utter one word from the whole sentence or either only shout to express the emotion. This ruins a lot of the impact of the story that is supposed to be one of the strongest elements of this game, being a new adventure for Luffy and his crew that can’t be seen in the original anime, so it’s a huge disappointment that the story is told in this way. The story itself is great and an original work of Eiichiro Oda bit it would have been better if the conversations were told in the way it is done in the anime. The world of One Piece: World Seeker looks like it just came from the anime, but it’s not perfect. It’s like time has stopped in this world as it’s always sunny and there are no changes in weather. All popular characters from the Straw Hat Pirates also look the part, but this game isn’t without faults. In the more urban areas, there are a lot of houses that have open doors with a fully designed interior, only you can’t enter any of those as an invisible wall blocks your way. Also, you would think that the urban areas would be crowded with people, but there are a lot less people than you would expect. Creativity in designing this population is also lacking as you’ll encounter a lot of people looking the same. Wildlife is also lacking in this game as almost no wild animals live on this island. In an encounter with one of the Navy big shots, Smoker, he had a very dark skin, while in the anime, he has a very pale skin. The sound in this game has the typical ‘One Piece’ feeling. Some music pieces have been used from the anime series. A huge downside is that the voices of the main characters are not used when in conversations. You’ll only hear single words when they’re talking, and you can read the rest. It would have been a lot better for the story and the atmosphere of the game if they did use the original voice actors, but not enough. 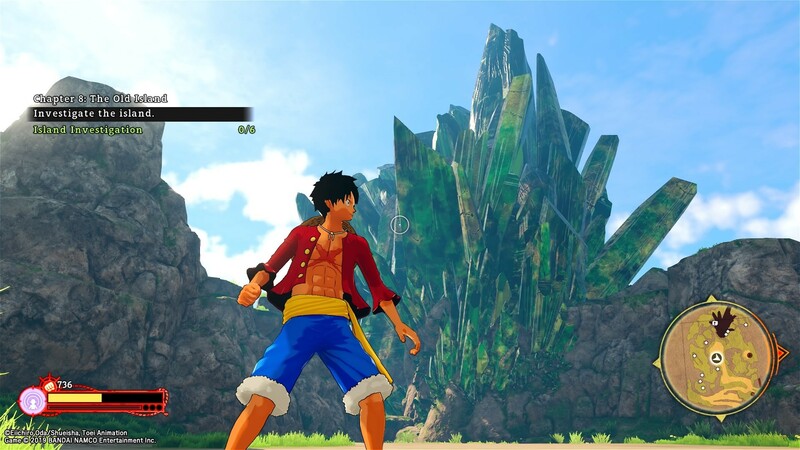 One Piece: World Seeker is an Action Adventure RPG in which you play as the captain of the Straw Hat Pirates, Monkey D. Luffy. This game features an open world on an all-new island to explore. This open landscape gives you a great opportunity to use Luffy’s handy Gum-Gum abilities. This new island is said to be a huge and borderless world, but this all seemed too good to be true. The island is relatively small and can be fully explored in a matter of minutes when using Luffy’s abilities to swing and fly around the map. It’s not like he can swing that far, the world just isn’t that big. If we are speaking of a world with no boundaries, you would expect that houses with open doors and fully designed interiors could be entered, but you’ll just walk against invisible walls that prevent you from getting in. 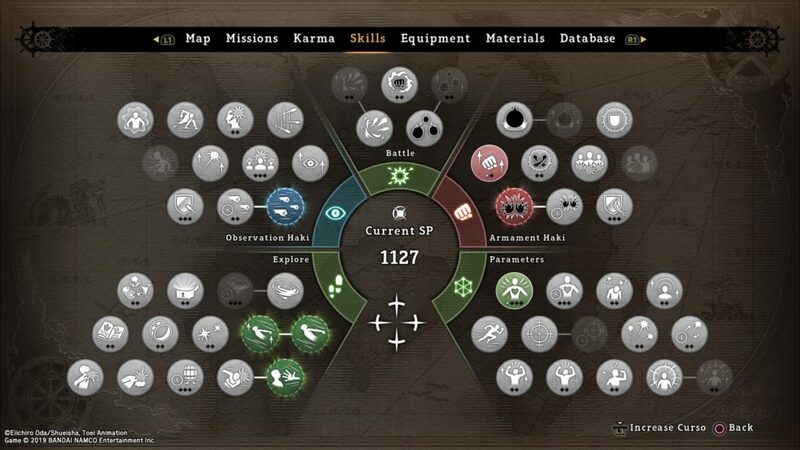 All attacks, except for the ranged attack and the special attacks are performed by pressing one single button. Aside of these normal attacks, you can use the powerful special attacks like the Red Hawk and the Elephant Gun attack. You can extend the amount of attacks you can use by spending skill points. For defeating enemies and completing missions, Luffy will earn skill points. These can be used to learn new skills in five different categories, Exploration, Observation Haki, Battle, Armament Haki and Parameter. Observation Haki, Battle and Armament Haki are used mostly for skills in combat while Exploration will let you acquire skills to better roam around the map and parameters will increase your health, speed and tension gain. Trying to combine attacks is not done in this game. For example, when an opponent gets knocked down, he will be invincible until all the animations of getting up are complete. Mostly, they will attack instantly after they get up and will almost always interrupt your attacks and hit you first. In normal mode, Luffy can dash away to dodge incoming attacks, but attacking after a dodge could have been made a bit smoother. The difficulty of the game isn’t providing any challenge in all fights, making it even possible to complete the game by using only the basic attacks. Scattered around the map, there are many shiny objects that provide materials, and chests will also contain materials and equipment. This equipment can be equipped to increase your attack or defensive power, but these will not be physically equipped to Luffy. Many people around the map will ask you to bring them materials in the form of side quests. These will earn you more skill points to gain more skills. 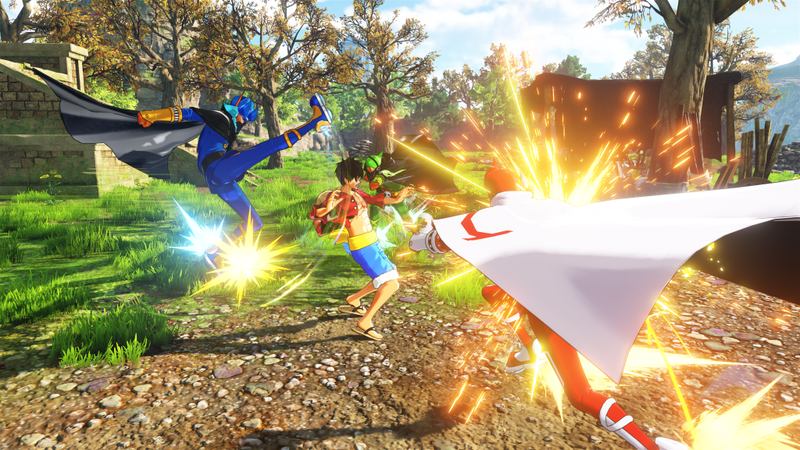 One Piece: World Seeker is not the game we’d been expecting. The combat offers not much of a challenge and with the intro movie, being almost the only voiced part of the whole game, this game could have done a whole lot better. This way of storytelling almost encourages you to skip all the talking because you must read everything with no voices. The reading part is okay, but with no voice acting to accompany the story, there’s just something missing. 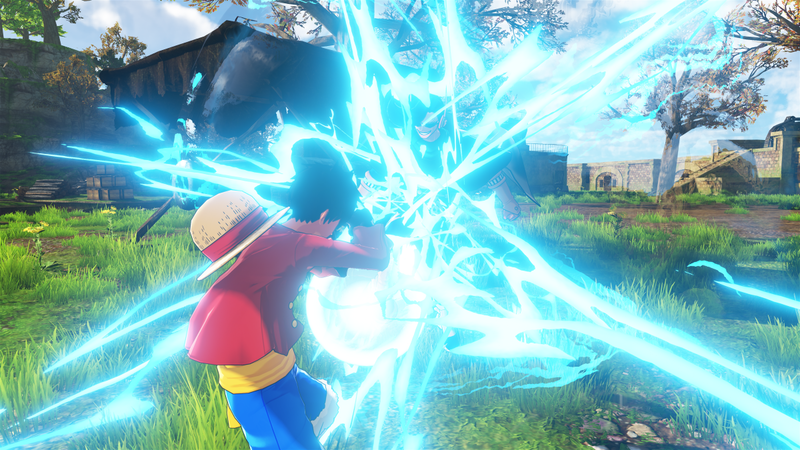 Luffy’s signature moves are worked out great but they aren’t necessary to win in combat, but it’s advised to use them, so the battles still appear to be somewhat fun. Flying around the map using Luffy’s Gum-Gum Rocket move can be a lot of fun but you’ll notice the map is very small. For fans, this game is a great opportunity to see some more of the Straw Hat Pirates’ adventures, but in terms of combat and overall gameplay, it could have been a lot better.